Dynamic optimization is rocket science – and more. 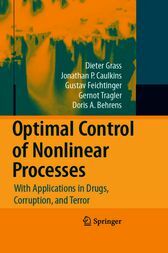 This volume teaches how to harness the modern theory of dynamic optimization to solve practical problems, not only from space flight but also in emerging social applications such as the control of drugs, corruption, and terror. These innovative domains are usefully thought about in terms of populations, incentives, and interventions, concepts which map well into the framework of optimal dynamic control. This volume is designed to be a lively introduction to the mathematics and a bridge to these hot topics in the economics of crime for current scholars. We celebrate Pontryagin’s Maximum Principle – that crowning intellectual achievement of human understanding – and push its frontiers by exploring models that display multiple equilibria whose basins of attraction are separated by higher-dimensional DNSS "tipping points". That rich theory is complemented by numerical methods available through a companion web site.